I’ve gotten very little done while super sick, but I managed to finish packaging and labeling all of the stuff that I made last week. I think these turned out pretty well for local sales. 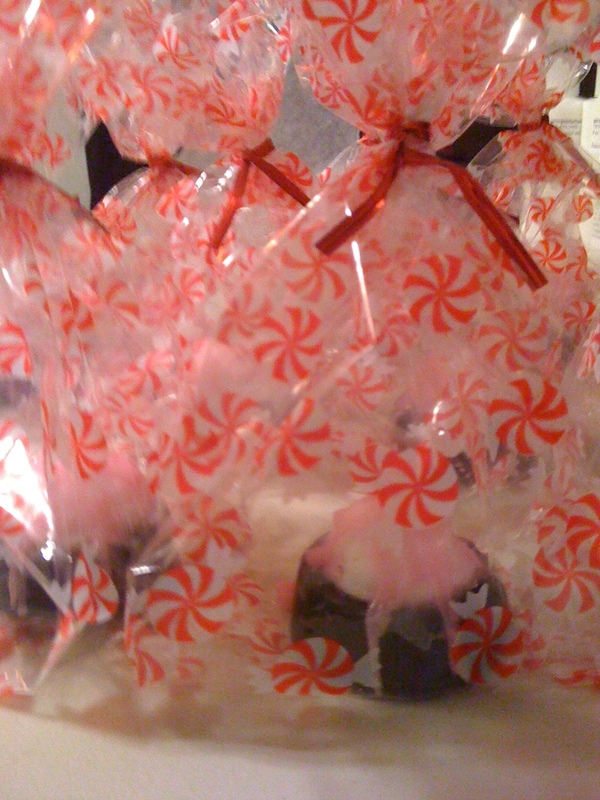 I even packaged them this way to add to the baskets. I made a “Sweet Treats” basket that has this soap, a licorice scented ornament soap (“Not your usual ornament” is what I finally decided to name those), Pumpkin Buttercream lotion, Hot Apple Pie body and massage oil, and a jar of each Gingersnap Cookies and Cherry on Top sugar scrubs. It’s a fun group of scents in my opinion. I also included the dessert soaps in my kids tin combo. In a little holiday themed hinged tin I added this soap to Ginger Girls soap, Not Your Usual Ornament soap, Bubblegum Victorian Heart soap, Bubblegum lotion, and Fruity Patootie Bubble Wash. It is more of a girl’s variety, but I figure that people could switch out the soaps if they want to give to a boy. I have the lids taped in an upright position with paper crinkles in the bottom to support the products. For display I have the products upright. The nice thing is that the person can adjust the items and then close the tin. Ready to pop under the tree with a tag. It’ll be interesting to see what variation the dessert soaps sell in. *smile* I think the tin with the soap in a truffle box inside, with stuffing, will work well for shipping too, as long as the postal worker pays attention to the this side up and fragile labels. I’ll keep you informed as I work through the possibilities.